Well, more stuff for the future. Needless to say, sometimes I get very confused. I've joked that I need a good Wall-of-Crazy program to hash out ideas and such, as actually taking over a wall with maps and post-it notes would probably make my wife cross. I prefer to not make my wife cross, so I don't do that. And then I discovered that the folks who made Scrivener-- which I deeply love as a program to write novels on-- made a thing called Scapple which is essentially a Wall Of Crazy program. So far, I'm really liking it. Still just using the trial version, but I'll be springing for it shortly. It's been a good way to get my head clear, and open up all the plans I have. And, reader, there are so many plans. Can't wait to share them with you. *- And currently available on NetGalley for reviewers! I feel like I've been very fortunate with the covers of my books. Paul Young has been the cover artist for all four books so far, and I'm given to understand that Sheila's intentions are to keep using him for my books, which suits me just fine. Because Paul gets the look and feel of Maradaine, and what I want the covers to evoke. He gives a cover that clearly says, "Hey, this is what kind of book you're getting." And it's spot on. And he's also receptive to my thoughts and concerns. Case in point: the Import of Intrigue cover, which is probably my favorite to date. There were plenty of tweaks from the initial image I was shown to the final version. We went through, for example, variants of Satrine's handstick until we had one that I was happy with. Paul also integrated the Tsouljan text I created into the signage. I love the look and feel of the whole thing. 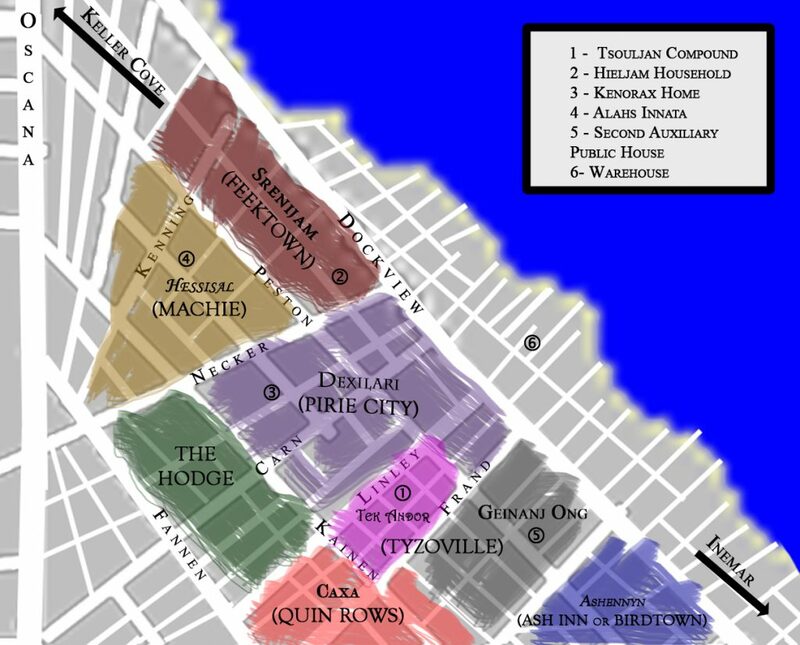 I've seen an initial concept for the Holver Alley Crew cover, and I'm already very happy. I can't wait to see the final version, and be able to share that as well. Since that book will be coming out in March 2017, that won't be the far away. But for now, we'll just enjoy the Import cover. Hey all-- busy day for me. 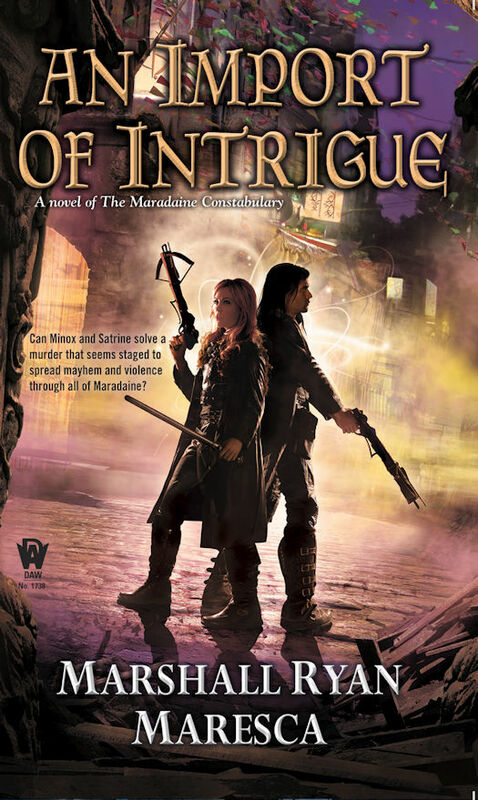 But look what's going on: A cover reveal of AN IMPORT OF INTRIGUE over at The Qwillery! Check it out. Folks, so much is going on. I thought I'd have a respite in August, but that is not in the cards. It's good stuff for me, but it's keeping me busy. Especially with AN IMPORT OF INTRIGUE now just three months away. And HOLVER ALLEY CREW comes out in March, only four months after that. 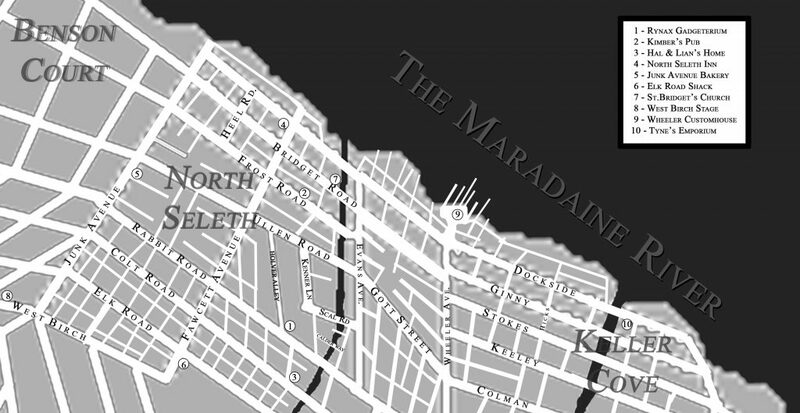 So, in the mean time, here is a bit of bonus material: the "close-up" maps for both books. Import focuses on the Little East, the collection of enclaves where most of the story takes place. The next map, for Holver Alley Crew , centers on North Seleth, in the west part of Maradaine. So, I'm primarily a novelist. That's the length of stories I write on the whole, that's the length that feels right in what I conceive a story to be. I'm not a big fan of writing short stories, in that I rarely have a short story idea, and I do have so many long-form ideas, so I feel like trying to conceive short stories for the sake of "short story" in and of itself is wasting my time. Note: I'm not saying short stories are a waste of time. I'm saying me trying to force myself into a short story box out of the idea it's something I "should" do is a waste of time. Everyone's mileage varies. I have plenty of friends who are short story masters, and novels make them want to tear their hair out. That said, having just come off the ArmadilloCon workshop, I feel like the teaching-writing environment, from the large workshops to smaller ones to critique groups-- tends to be shorter-work focused. This makes sense-- a teacher will have an easier time reading and critiquing something that's 5000 words as opposed to 100,000 words. The challenge then is this: there are very few resources out there, especially for the genre writer, to learn how to novel. At best, people are taught how to short story, and then told, "You know, do that, but longer" and thrown out into the woods. I know in the workshop this year, most of the students described "novel writing" as an intended goal, but most of them came in with a short story (as opposed to chapter one of a novel, which was allowed but somewhat discouraged). If we ("we" as a genre-writing community as a whole) are going to engage in teaching writing, we need to create more resources for the novel-writing student. I have some ideas of how to do this, but they need time to ferment. That, and I have plenty of other work to do right now as well. I'm a little late here on Monday because, well, this weekend was ArmadilloCon, which-- excellent. But that does put me in 'recovery' mode right now. Not only recovering in terms of physical and mental energy, but also the household- and work-type things that get neglected because I spent the whole weekend at the con. So, we kicked off with the Writers' Workshop, which went very well. All our teachers did a great job, and they deserve plenty of praise: Stina Leicht, Joe Monti, Joe McKinney, K.G. Jewel, Eugene Fischer, Amanda Downum, Patrice Sarath, Urania Fung, Mark Finn and Tex Thompson. Everyone did great work contributing to our discussion panels and in their individual critique groups. Wesley Chu joined us for our final Q&A with the students, and many of the students seemed to leave feeling engaged and energized. Which is good, because sometimes the tone can veer into "You want to be a writer? Why, dear lord, why?" Friday night I only had the one panel, on Harry Potter, which was well attended and went swimmingly. We were largely supposed to be talking about the new book, but since none of us knew anything but the basics, (It's a stage play, with Harry & friends as adults and their children at Hogwarts), there was only so much we could say about that. But we easily talked about all things Potter and a lovely time was had by all. Saturday was packed with panels, which is how Saturday should be at any con. I got to talk about A Murder of Mages in the Law Enforcement in SFF panel (where I was glad to get insight from actual Law Enforcement practitioners like Myke Cole and Joe McKinney). I got to argue the differences between different kinds of sequels with Rick Klaw and others in the Attack of the Sequels panel. The "big panel" was the Writing What You Don't Know with Stina Leicht, Wesley Chu, Tex Thompson, Nicky Drayden and Kirk Lynn. It was, essentially, the diversity panel with a better title ("Writing the Other", to me, sounds too intentionally divisive.) It went very well, because everyone on that panel is very smart. I lean in the direction that as a writer, it's better to try to walk through the minefield of "doing something wrong" and learning from it, rather than not trying. But it's also important to keep your ears open, so when someone is shouting, "Hey, that's a mine you're about to step on!" you not only avoid it, but learn to recognize them. In the evening I had a fun panel on Time Travel with Kevin Jewell and Rebecca Schwarz, which was surprisingly heavily attended. Like, room packed to the gills. Then we had a late night panel that was a Horror Movie game show, hosted by the delightful Professor Griffin, where I was joined by fellow contestants Amanda Downum, Tex Thompson and Dawn Humphrey (of Women in Caskets), and we all learned that there are depths of horror movie obscuria we were not aware of. And I should add that I not only got to attend the Women In Caskets live podcast recording, but Dawn and Jen Brown of said podcast were an absolute delight for the whole con. I've known them both for years, back in my theatre days when they were running a company called The Vestige Group, so it was great to have them around. But now: there is work to do. Books won't write themselves, and if they did, I'd be out of a job.